I’b god id. | carpe diem! If you’ve ever wondered where that cold went, the one you had when you were a child, the one that moved from your throat to your lungs to your head and gave you nights that lasted an aeon because you couldn’t breathe and your throat hurt, and then you had to cough and you realised that your throat really hadn’t been hurting at all, because the cough made it hurt so much more… I’ve got it. I’m winning the battle, but the end is some distance yet. 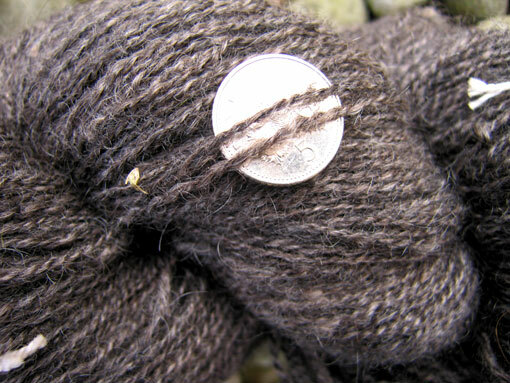 Spinning these two yarns was another of those learning experiences. Spun a sort of backward supported longdraw (fibre in my left hand drawing back as the twist enters it while my right hand pinches to stop twist now and then to allow the developing singles to thin as my left hand moves back), the cloud almost spun itself; the smooth glossy fibres just slipped neatly together to become the singles. The grey was different. Very different. There’s been some discussion of the difference between roving and top on the Ravelry groups, made more complex by the difference between UK and US terminology. This was roving in the US sense: basically a carded prep in which the fibres are only roughly parallel to one another, and may be of different lengths. (If combed, this roving becomes top in which all the fibres are truly parallel and are generally of more uniform length.) The Merino in the roving adds elasticity and bounce, and flows differently into the singles. I tried to match the WPI of the stuff I got from the cloud, but found it difficult as this really did want to be a thicker yarn, plus it bloomed beautifully after washing and whacking. The end result is a little thicker, but not badly so and I think the two together will be a top-down triangular shawl, dark grey with a white strip of finer lace (I’m thinking something Estonian with nupps) about 2/3 of the way down. I’ve just started the last of the stuff from Terry, a beautiful blue 80% pygora/20% silk batt. To prolong the pleasure (I really do like this pygora stuff) I’ve decided to spin it as thin as I can. It’s perhaps a little thinner than it looks there, although I do have small fingers 🙂 It’s 60-65wpi. 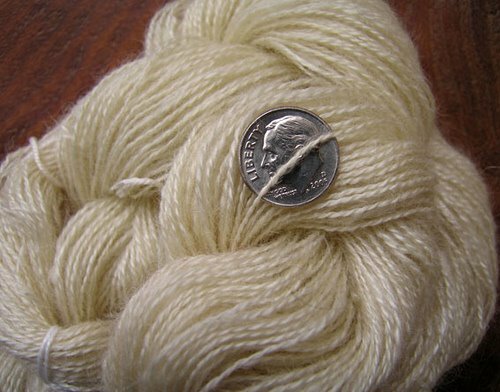 I wonder how much yarn I’ll get out of 2.4oz? What you can’t see (well, you can, but it’s not obvious) is that I’m spinning that on the high-speed bobbin and the high-speed whorl that I bought last week for the Schacht. 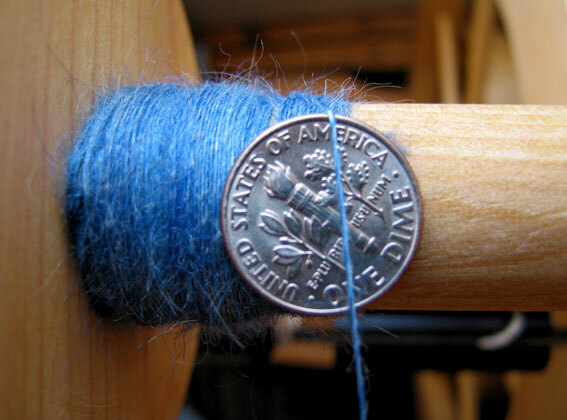 Not the highest high-speed bobbin, but it’s faster than the fastest shipped with the wheel. I’m getting better at this. The difference is more subtle than I’d expected, so I’m glad the change in pattern highlights it. I wanted to learn something else new from this, so I’ve taken the opportunity to try beading using a crochet hook (8/0 beads and a 0.6mm hook). It’s easier than I’d imagined and quite effective although I’m not sure I’ll wear it. Next decision comes at the end of the second LoV repeat: I want to go back to the darker red. I could just finish the shawl in it, or perhaps not – I’m not sure there’s enough. 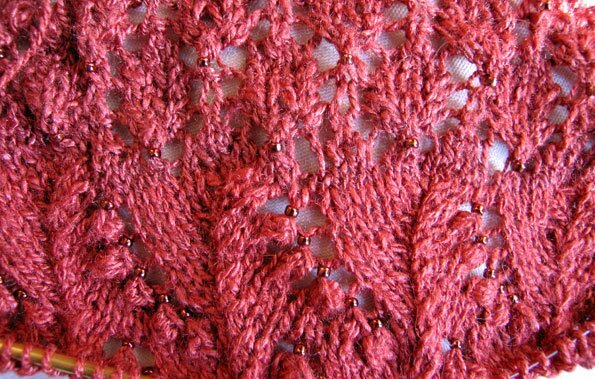 I am tempted to add a single repeat of another Estonian lace pattern, then revert to the brighter red for the edging. Decisions, decisions. This entry was posted in Uncategorized on January 31, 2009 by sarahw. Oooh, that’s lovely. It’s obviously not your original intent, but you ended up with one of my very favorite colors. 🙂Feel better soon! OH no! I hope you get over “it” soon..Beautiful spinning! 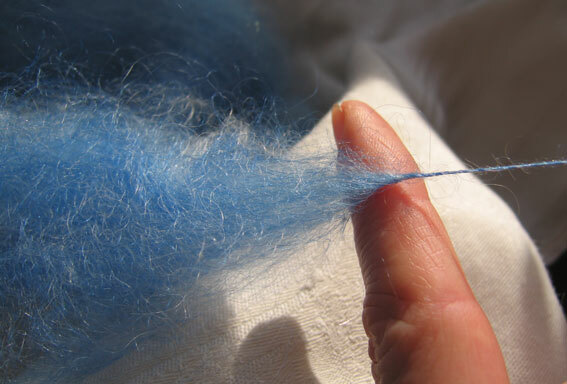 Terry offers lovely fibers from her pygoras–I bet they feel as luscious as they look!! Sarah, anything that is fiber related qualifies as exercise. LOL!Glad you are feeling better. I love your yarns. They are beautiful! I’m so jealous. I can barely knit well compared to your skills. I couldn’t dream of spinning fibers. Can’t wait to see the beautiful fabrics you will create with them. I especially like the blue one.I have awarded you the Kreative Blogger award. Go over to my blog to see….Congratulations! Love that white yarn, it looks so glossy! I am knitting a swallowtail from some of my handspun yarn, actually it is my only laceweight I have ever made…not sure I will make any more, I got a bit bored with the miles of endless spinning! lol..love the colour of yours, very pretty!